It's alive! It's alllllive! This 8-inch Frankenstein's Monster Bust Bank helps any boil or ghoul save money while paying tribute to one of the most iconic Universal Movie Monsters of all time! 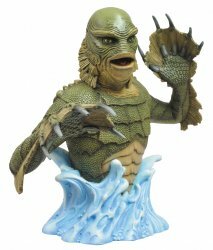 Creature From the Black Lagoon Bust Bank available separately. A Diamond Select Release! Spinning out of DST's successful line of Star Wars bust banks comes the all-new Universal Monsters series! 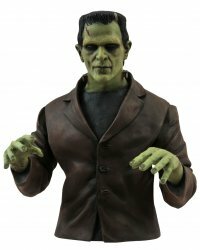 The most famous monster of all, Dr. Frankenstein's Monster, kicks off this new line of 8-inch vinyl banks, which features highly detailed sculpts and paint. From the front it just looks like a high-quality bust, but turn it around and there's a slot to keep your change in! Nobody will want to raid your savings when they're safe inside this resurrected giant! Uh, no thanks, Frankie, keep the change! Also want the Creature From the Black Lagoon Bust Bank? Click the convenient Buy Both button below!